War of the Spark Preorders Now Available! *Comes with Buy-A-Box Promo while supplies last. Available for pickup prerelease weekend while supplies last. The Guilds have been defined, now it is time for the main story resume! It's all Planeswalkers on deck as the war against the malevolent Nichol Bolas reaches its stunning climax! Come join SpaceCat in welcoming in the latest Magic the Gathering set, War of the Spark! Prerelease events will be on April 27th and 28th at 2:00 PM and 7:00 PM each day. Each event will cost $25 to enter. Each player will receive a prerelease pack containing 6 packs of War of the Spark, 2 dated foil promos (one of which is guaranteed to be a Planeswalker), and a spindown life counter. Players will get roughly 40 minutes to build a 40 card minimum deck with the cards in their packs plus basic lands which we provide, followed by playing three 50 minute matches (best 2 out of 3 games) against other players in the event. Prizes will be 5 packs for 3-0, 3 packs for 2-1, and 1 pack for 1-2. 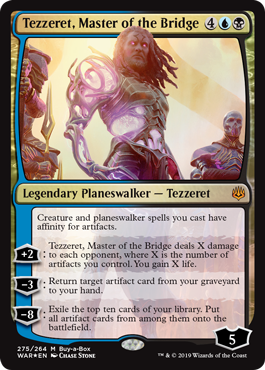 With a guaranteed Planeswalker in every booster pack, 3-0 will get you a minimum of 12 Planeswalkers between your prerelease pack and prizes! In addition, preordered booster boxes of War of the Spark will be available for pickup that weekend! Due to scheduling conflicts (the biggest being that May 4th is Free Comic Book Day, our single busiest day of the year) there will be no sealed release event for this set. We will still have a Draft Weekend booster draft on Saturday the 4th at 7:00 PM. This event will cost $15.99 plus tax to enter, and will be pack per match win for prizes. 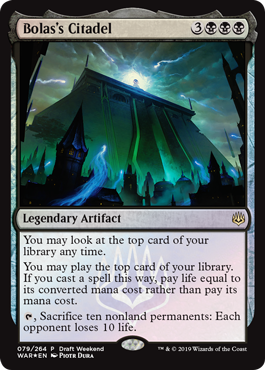 The Draft weekend promo is Bolas's Citadel. Usually open house would be the weekend before prerelease, but that weekend is Easter weekend, so Wizards rescheduled it to release weekend for this set. We will be holding it on Sunday May 5th, starting at 12:00 PM. Each participant will receive a Welcome Deck, a promo card which has not been revealed by Wizards yet, and lessons on how to play the game. The perfect event to get a new player started or a returning player back up to speed! 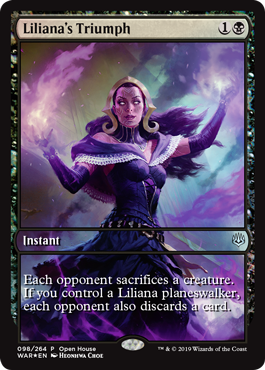 The Open House Promo is Liliana's Triumph. For more updates, check out our Facebook Events Page! *Comes with Buy-A-Box Promo while supplies last. Magic the Gathering Saturday Night Commander! Every Saturday, SpaceCat is hosting free Saturday Night Commander at 7:00 PM! 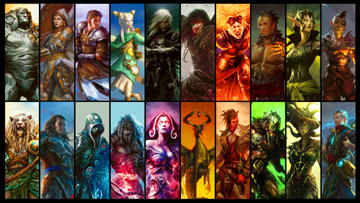 Come join us to play the best Magic the Gathering format there is!